Evan had the IV in his head removed yesterday! He has had an IV going since August 3 (21 days)! And he was on bili lights for a few days before that! So for the first time since July 30, Evan doesn't have any medical equipment! 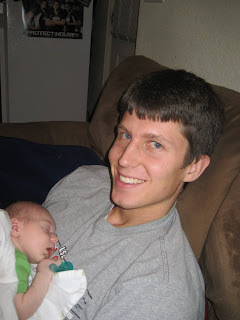 We finally have a "real" baby and are loving how easy it is to hold him now! The stinkin' nurse that came and removed the IV didn't bring any adhesive remover-so Evan has a nice bald spot now where all the tape was holding the IV in. But if anyone can pull it off, it's Evan! Guess who's at our house?! 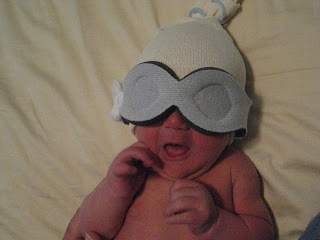 That's right-our little Evan was discharged from the NICU Thursday afternoon! He had passed all of his exams/tests and the only thing keeping him there was his last antibiotic. So the Doc sent us home with the IV still in his head and we just hook up his medicine to it every 8 hours. He has to be on the antibiotic until August 24th. We are so happy to have him back in our home and doing so well! So we just heard from the doctor...if Evan can wean off of all of his tube feeding and just nurse, we'll be able to take him home towards the end of this week! He'll still be on antibiotics, so a nurse will have to come to our house every 8 hours to administer that to him through his IV. We're a little overwhelmed by the thought of having him at home without any nurses, but couldn't be happier to get to have our baby back! Thanks once again for all your prayers and support-we really do appreciate it! He's opening his eyes again and is so much more active and awake now! PS-We would love to have visitors, but it might be a little while before it's safe to have people in our home. His little immune system has been working over time and needs to get strong again. Once it gets stronger and it's ok to have visitors, it will be even a little bit longer before others can hold him. We've been so blessed to have pretty much nothing but good news! Evan is doing so well! His infection levels and bili levels drop everyday. His head was pretty inflamed from all the swelling, but his measurements also continue to get smaller. He looks so much better! He's starting to cry more and he is getting his little wiggles back! We try to nurse a few times a day, and that keeps getting better as well. We are now on day 4 of the 14-21 days of antibiotics and the Dr has said that we might be able to finish the last few days at home! They are weaning him off the oxygen and some of his medications. Overall, he is just doing so good! Thanks again for all of your prayers and support. We are so thankful to have so many good friends and family members to help us get through this hard time. We appreciate all of you so much! First of all, we'd just like to thank everyone that has remembered our little guy in your thoughts and prayers. We have definitely been able to feel of your support and love. It means so much to us. The last 2 days have been much better. He already looks 10 times better than he did on Monday and is starting to move around a little more and make a little more noise. Who ever thought his little screams would sound so beautiful?! We've started to get test results back and they have discovered that the specific bacteria is Group B Strep. So even though I was given antibiotics for it during labor, he still picked up the GBS. But the GBS meningitis is the most common type and apparently it's the one to get if you get it at all. So we were happy to hear that. His bili has come down significantly, but they want it even lower since it is paired with the meningitis. 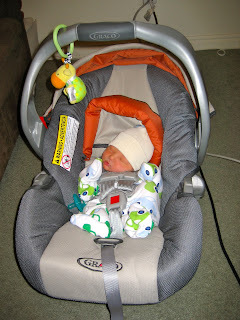 Evan was having problems with his blood pressure and his heart contractions. So he got another IV for those medications. But he's already off both of them. All of his vitals have been really good and have stayed stable. He's such a strong little boy! Today we found out that his blood culture from yesterday came back negative-if his blood culture comes back negative again tomorrow the countdown to coming home begins! It will still be another 2-3 weeks, but at least we'll be on our way. We are so grateful that we are already getting those negative results back so soon. He had a brain ultrasound done today and everything came back normal. Mom and Dad have been able to get a few good nights of sleep and we're eating better. Things are still pretty crazy, but we're making some really good progress. We were able to hold him a little bit yesterday and helped to give him a bath today. We love our little guy and just can't wait for him to be better! So today has been one crazy, terrible day. For those of you who haven't heard, Evan was admitted to the hospital today. He was fine last night and then when we got him up for a feeding really early this morning he was breathing kinda funny. And then he wouldn't eat and he was really lethargic. We tried to wake him and feed him, but he just wouldn't. So we called the on call doc who suggested we take him to the ER just to be safe. So we took him to the ER and we're so glad we did. Evan really wasn't doing very well and the ER Dr started ordering lots of different tests for him and they put him on an IV to get him fluids since he wasn't eating. Basically the Dr was afraid he had either some respiratory distress or meningitis. So they sent us up to the peds floor to get more testing and monitoring done. 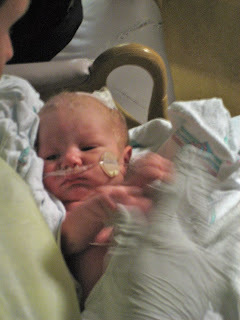 Before we knew it, he was surrounded by nurses and doctors and was being prepped for a spinal tap. When the results came back, it was confirmed that our little guy has bacterial meningitis. Needless to say, we've had a really long, hard day. They wanted to life flight him up to Primary Children's Hospital, but they were full. So they cleared out a room for him in the NICU where he could be isolated. And that's where he is now and will probably be for the next month or so. He's doing as well as we can hope he can be and really being a little trooper. He's had 4 different antibiotics, a steriod, blood pressure and heart medicine, food, and other different IVs throughout the day. It's been a rough day, but he's really hanging in there. We'd really appreciate any prayers in Evan's behalf. He has a long ways to go and could use a little help. We love him so much and are eager for a full recovery so he can join us at home again. So we're all home and doing pretty well. I was discharged from the hospital on Thursday night at about 8:00. We ended up leaving without a baby. 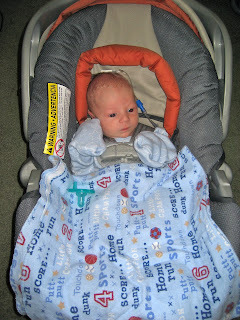 Evan had high bilirubin levels, so he had to hang out a little while longer to get his levels checked again. We went back a few hours later and his levels had improved enough to be able to come home with us! We were so excited! He has been on lights ever since, but we're just so glad to have him home with us. The first night was a little rough, but he has been such a good baby since. We sure love this little guy and are so happy to have him be a part of our family!